When one thinks of secret police, art is rarely the next subject to come to mind - unless it's in conjunction with the quality of censorship. 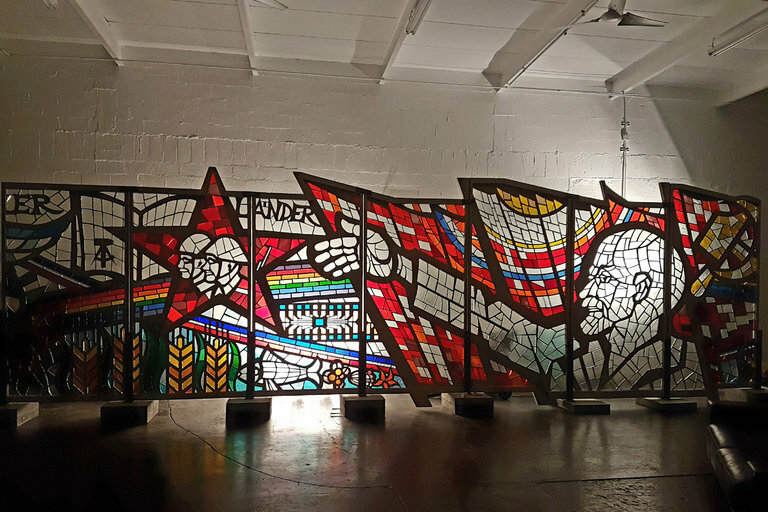 Yet apparently, for the East German secret police post-World War II, it was quite a common thing to commission huge stained glass pieces commemorating particularly significant iconography - Lenin, naturally, as well as doves to symbolize the peace they believed they were protecting. One particularly large piece commissioned in 1979 by Erich Mielke, the head of the Ministry of State Security, will be going on sale in conjunction with the Art Basel Miami Beach art fair that everyone is so particularly enamoured of. The price tag is a whopping $21.4 million dollars, although many appraisers scoff at such a ridiculously high price tag. An admirable sentiment, especially as it seems like the specter of facism is rising again in the modern world with the election of Donald Trump and the continued reign of Vladimir Putin. Remember: facism almost never makes worthwhile art, because, as Lillienthal said, you have to do what the dictators want - not what your artistic soul desires.